My 2 groups of kindergarteners are big on personality. 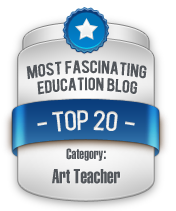 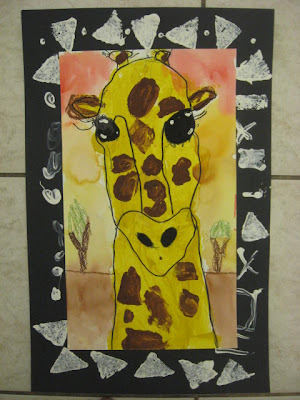 It is a great age to teach because they are so fun, silly and bold - just like their art. So I came up with this project with their humor specifically in mind. 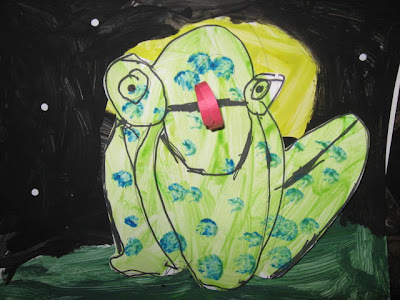 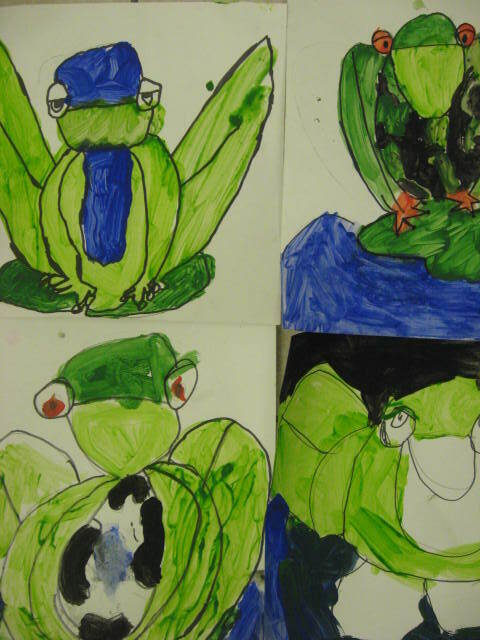 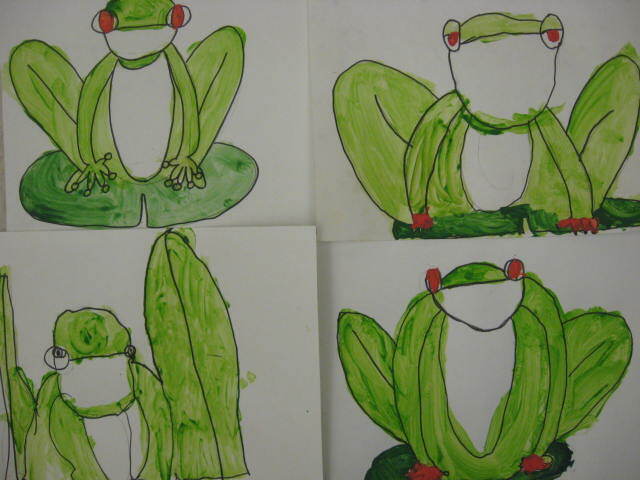 After a direct line drawing lesson, they painted their frogs on lily pads. 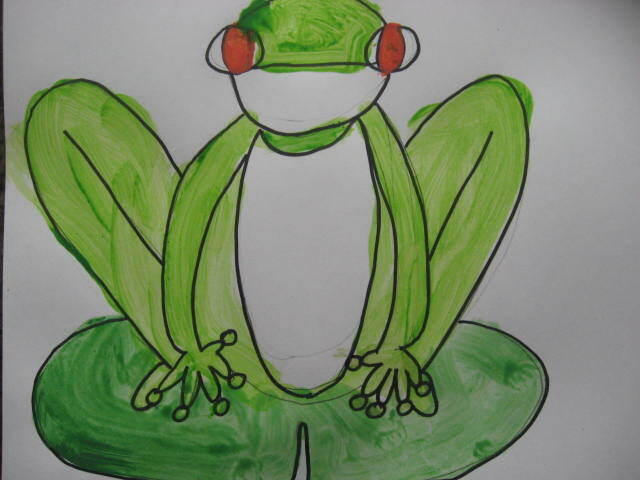 I didn't limit them to green, but most opted for it. 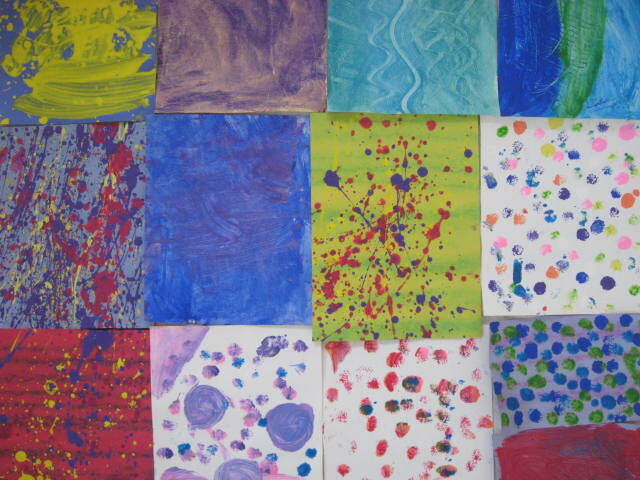 We painted our backgrounds on a separte piece of board. 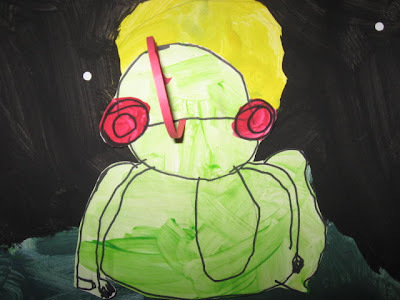 We kept it simple - large moon, blue-green pond and midnight sky. Some children preferred a daytime scene. The frogs are cut out and glued to the background. 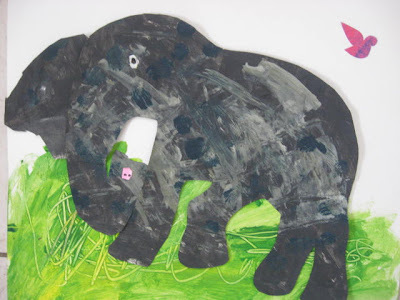 But first they cut a long tongue from construction paper which they wrap around their finger to make it curl. This is slipped into a small slit that I cut on the frogs' mouths. 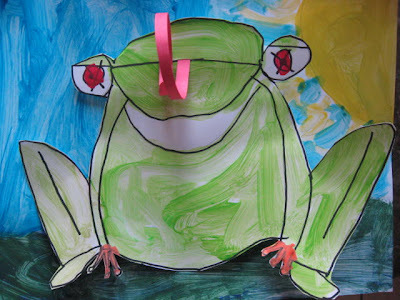 As I expected, a few boys plan to create a fly for their frogs to catch. 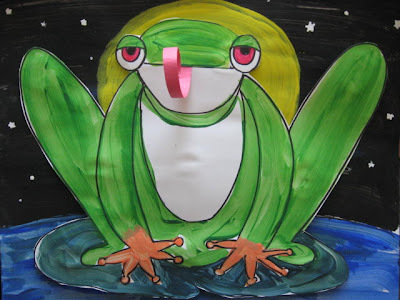 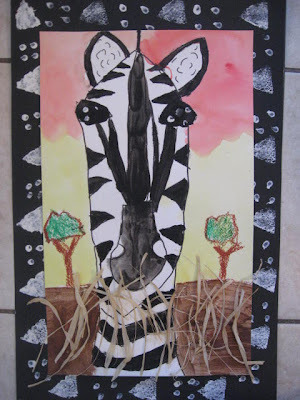 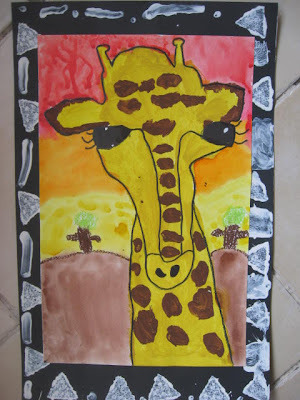 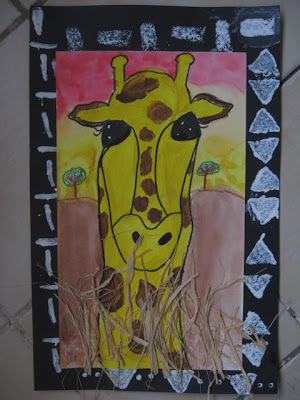 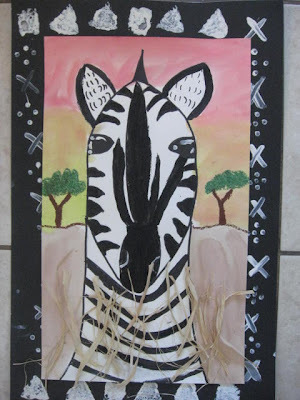 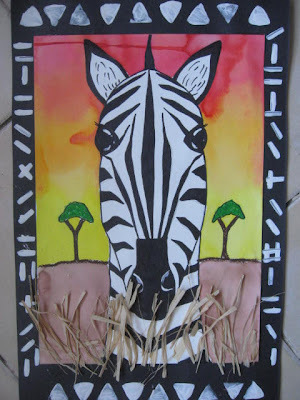 Patty at Deep Space Sparkle posted this art lesson a little while ago. 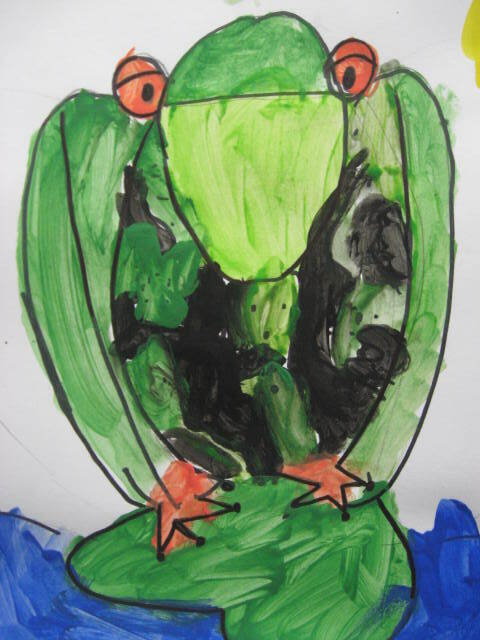 I decided to try it out with my kindergarteners. 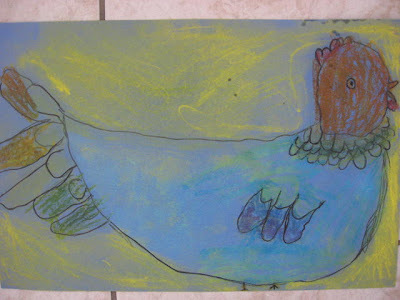 After the clouds of chalk dust cleared, I was left with some pretty adorable hens. 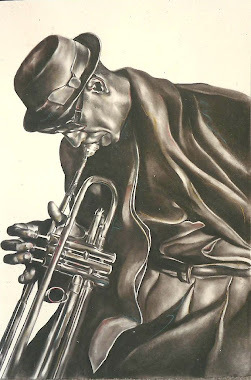 Since few of my students had ever used chalk pastel, I think it was a great opportunity for them to get the feel of this medium. 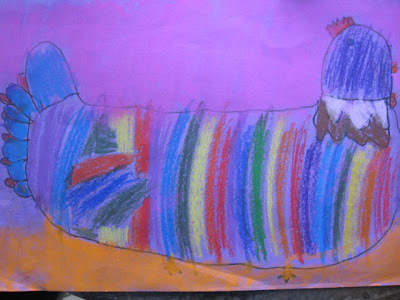 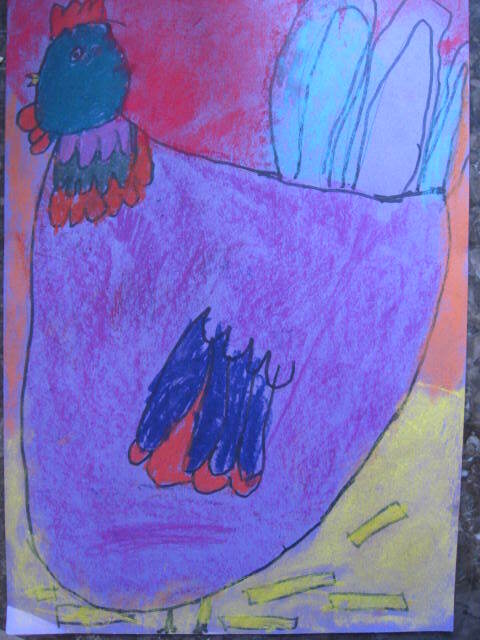 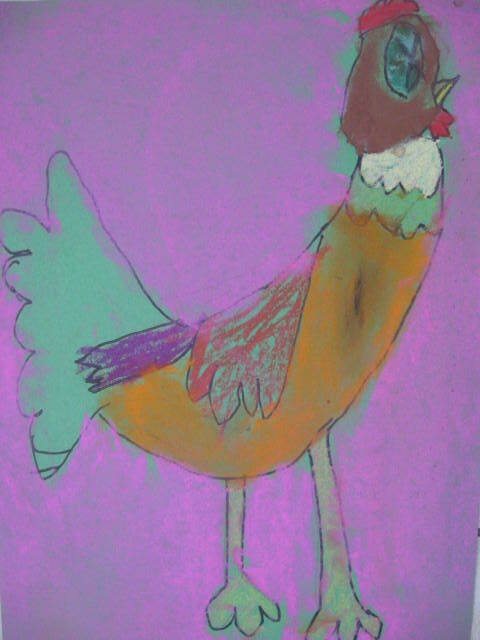 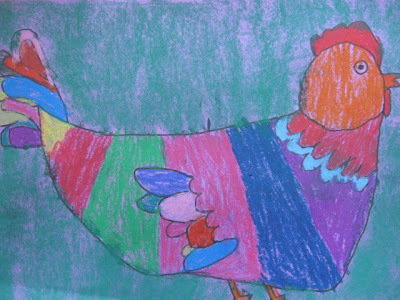 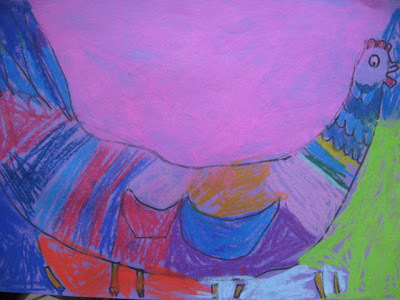 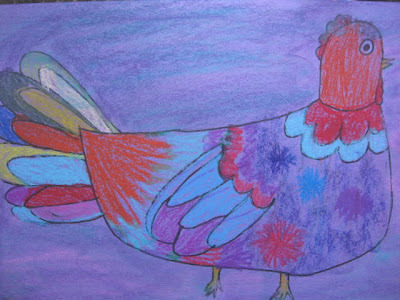 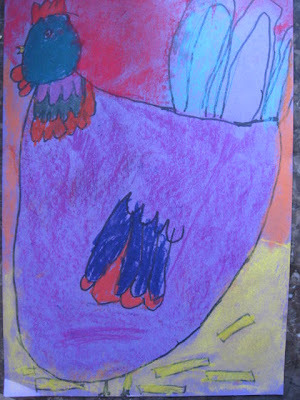 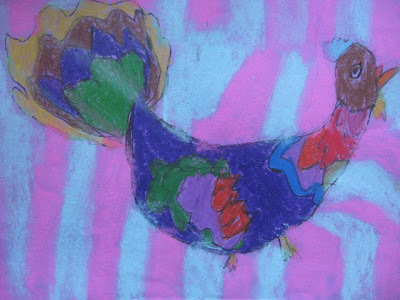 The hens themsleves were first drawn in permanent marker and then the details colored in hard with oil pastels. 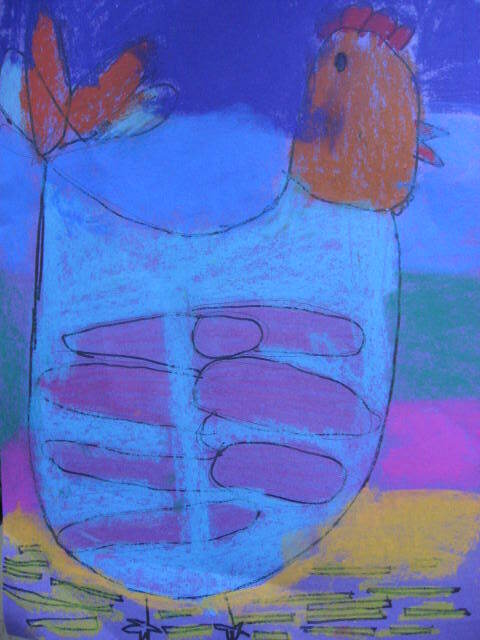 Lastly, I told the children to use a light touch when using the side of the pastel rather than the tip to add color to the background. 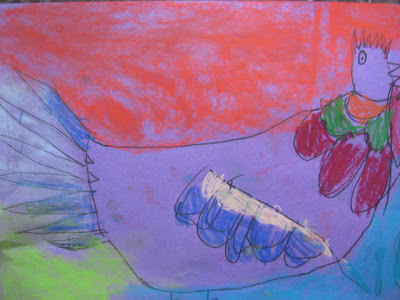 Despite my direction in choosing just one finger to blend the pastel with a circular motion, I was left with a lot of brightly colored hands. 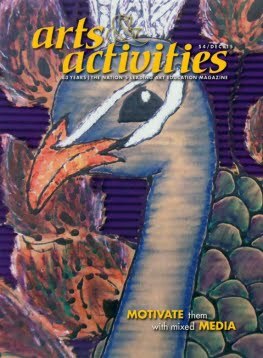 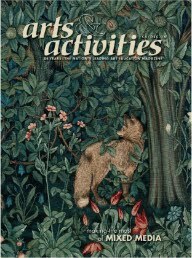 But what fun they had! 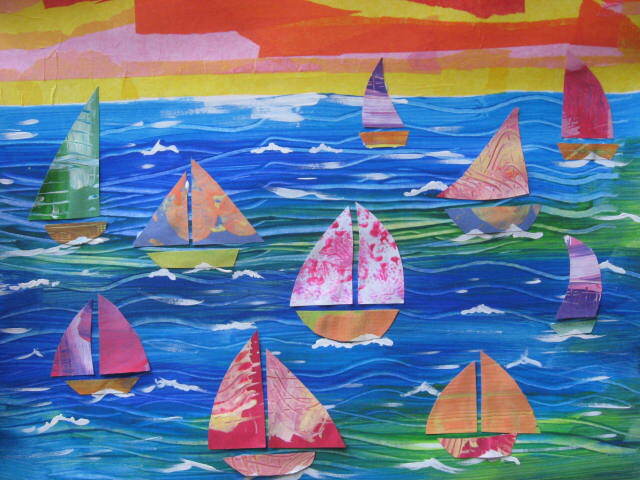 We live in a beach town where instead of "how's the weather?" 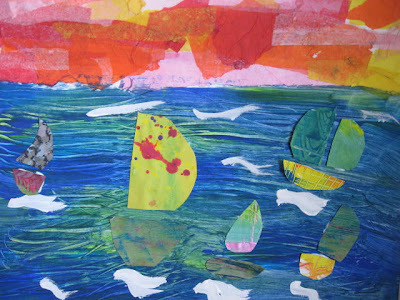 you often hear, "how's the surf?" 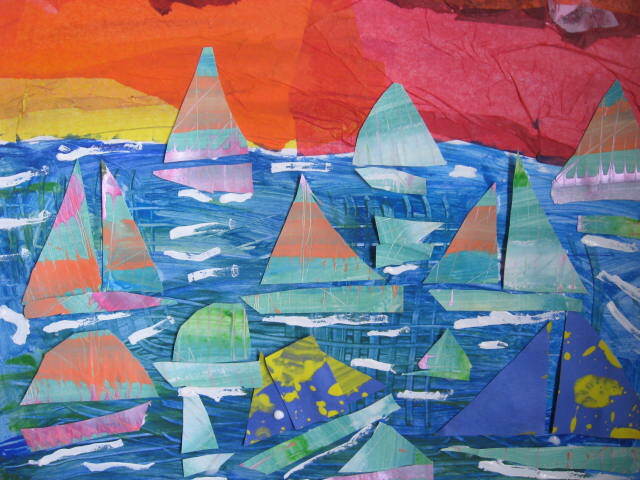 Many of my students spend a huge amount of time at and in the ocean. 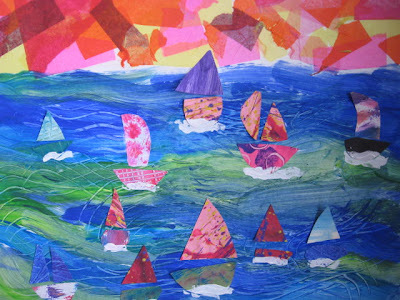 So I thought it would be nice for my 2nd and 3rd graders to create a colorful sailboat collage using some of the Eric Carle style techniques. First, the sky is created using torn strips of tissue in sunset colors. 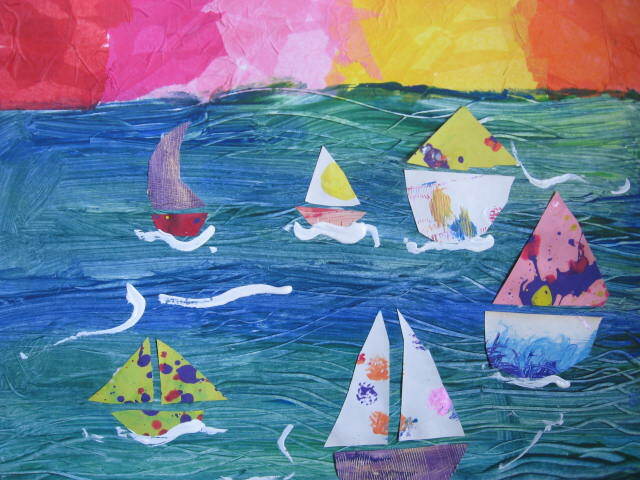 These are decoupaged using a glue and water mixture. 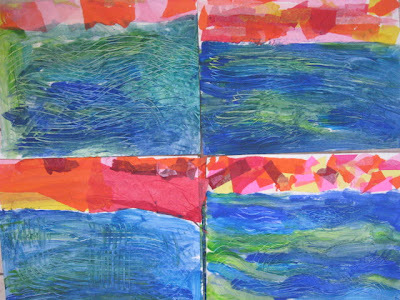 The ocean is created with blues and greens (tempera) and then "combed" over with a cardboard comb to create currents. 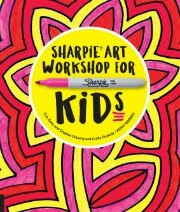 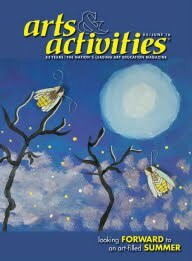 The children will create a variety of colored textured paper using combs, cotton balls, bubble wrap ect. The following week they will cut out simple sailboat shapes from their textured papers. Lastly, with a small brush and white acrylic paint they can create white caps in their water. 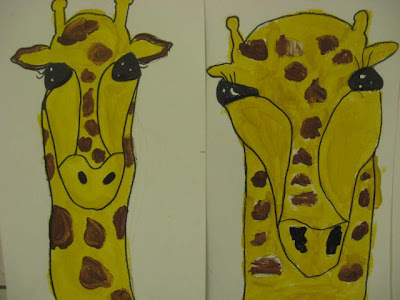 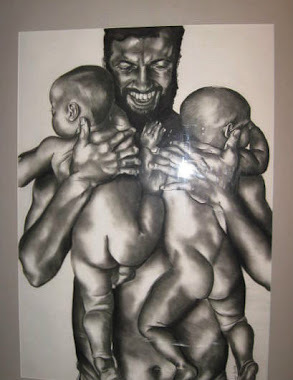 I think their parents will love to hang these up. 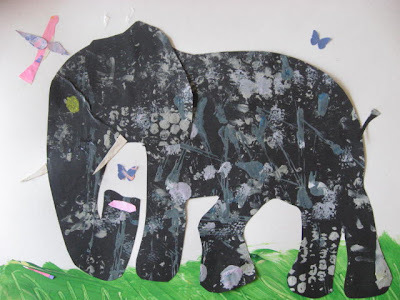 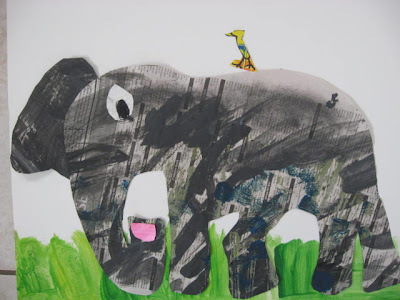 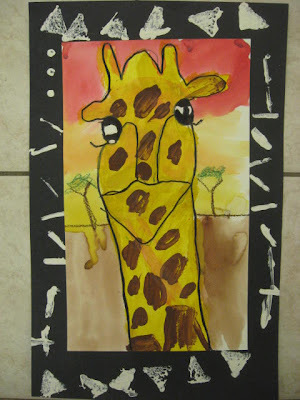 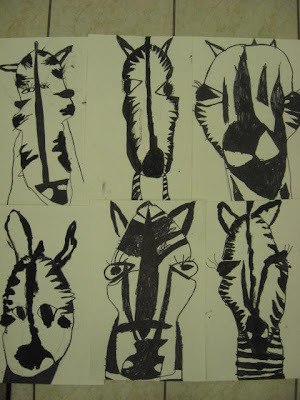 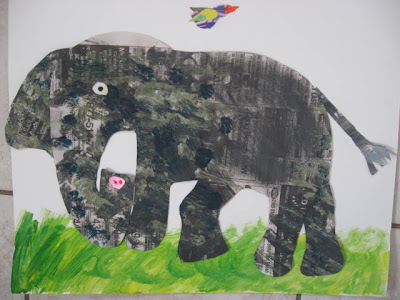 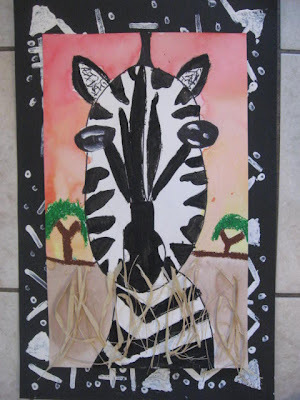 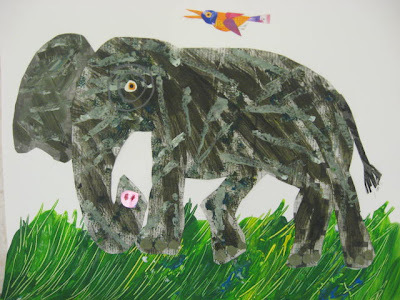 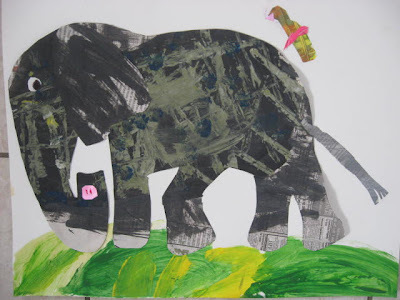 I did the same Eric Carle inspired elephant collage project with my 2nd kindergarten class with a few changes. Instead of newspaper we used black construction paper with 3 different tints of gray. 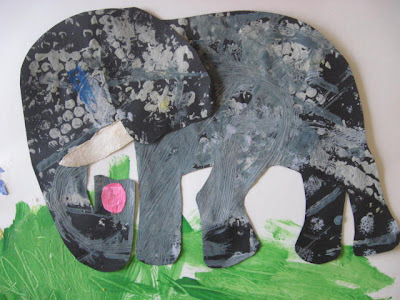 To create texture we used bubble wrap, cardboard and spikey rubber balls. 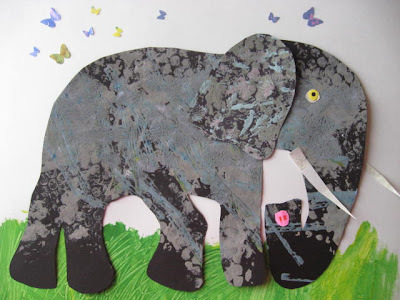 For some added whimsy and color I have a butterfly punch that they can use with scraps of brightly colored textured paper.